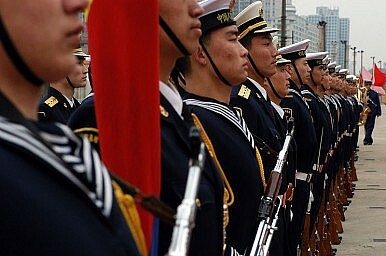 China announces another double-digit rise in military spending. It’s unsettling the country’s neighbors. China’s defense spending – now officially $106 billion but estimated by the Pentagon and independent researchers to be more than $160 billion – is on track to exceed that of all its Asian neighbors combined within a few years. This is particularly striking in light of a wider Asian arms race: India is the world’s largest arms importer, Japan is ending its ban on military exports, and Southeast Asian states are procuring submarines and other sophisticated capabilities. Asian countries now spend more on their militaries than do the nations of Europe. And unlike in Europe, where nations are allied in a zone of peace, Asia is a competitive arena where disputes over territory and history are alive with danger. However, it’s less the size of China’s defense budget than its composition that alarms so many beyond its borders. Chinese military spending privileges the navy, air force, and strategic nuclear force – instruments of advanced power projection – rather than traditional defensive capabilities. What exactly does China seek to do with its large and growing fleet of advanced attack submarines, a blue-water navy including an aircraft carrier, and stealth attack aircraft? No Chinese leader has yet explained how these capabilities contribute to China’s peaceful rise. If China’s diplomatic strategy has been to reassure its neighbors, its military acquisitions have done precisely the opposite. These military capabilities also raise eyebrows because some expressly target unique U.S. vulnerabilities – including the U.S. military’s reliance on information dominance and aircraft carrier battle groups. China’s development of anti-satellite weaponry is designed to “blind” U.S. fighting forces in the event of conflict. China’s acquisition of “carrier-killing” ballistic missiles promises to have a deterrent effect on the U.S. Navy, whose plans for the defense of Taiwan and other allies hinge on carrier access to Western Pacific waters now in China’s target zone. Aggravating these concerns over Chinese power projection and anti-access capabilities has been China’s recent assertiveness towards its neighbors. China’s sharp-elbowed claims to the South China Sea – an international waterway through which one-third of world trade flows – have mirrored Beijing’s revisionist claims to settled Indian territory in Arunachal Pradesh. China’s 2010 ban on exports to Japan of rare-earth minerals following a clash at sea in Japanese waters was the first time China has used its economic power as a political weapon, a lesson to those who believed that the business of China was business. Ironically, China’s best efforts to increase its security by developing powerful military capabilities and asserting its interests more vigorously may only render its leaders more insecure. Other Asian countries are moving closer to the United States, and each other, to balance growing Chinese power. President Barack Obama is reorienting the United States’ military posture away from Europe and the Middle East in ways that reinforce, rather than diminish, the U.S. leadership role in Asia. Resentment of the uses and abuses of Chinese power has also spilled over into the economic realm: Western businesses are no longer the cheerleaders for China they once were as concerns over economic piracy, currency manipulation, forced technology transfer, and the role of the state in the Chinese economy come to the fore. No matter how much they spend on defense, or to what end, China’s leaders have a deeper reason to worry. Economic growth is slowing; as the World Bank and others have argued, China must undergo an economic transition to a more sustainable development model that will necessarily require political reform. This will change the nature of the relationship between China’s authoritarian regime and its people. Despite the recent military budget increase, China this year will still spend more on internal security than on national defense. It makes one wonder: who do Chinese leaders believe is the real danger? Daniel Twining is Senior Fellow for Asia at the German Marshall Fund of the United States in Washington DC. This article originally appeared on the GMF blog here. No Surprises on China MilitaryShould Russia sell Su-35 to China? Training Begins on Stealth JetGodzilla Attacks!America’s New Asiatic Fleet?